Naturalized in California. Present in 18 counties according to Calflora. Naturalized in China, Japan, India, Indonesia, Sri Lanka, Thailand, Vietnam, Australia, southern Africa, southwestern Europe, Central America, the Carribean and North America. Naturalized in California. Present in 18 counties according to Calflora. There are many points in GBIF, including areas of Europe, South Africa and Australia that are similar to California. It invades and establishes in highly disturbed natural ecosystems where it grows in dense stands, displacing indigenous vegetation and altering the lower strata. It is listed as invasive in China, Japan, parts of Africa, United States, Puerto Rico and Australia (CABI Invasive Species Compendium). Queensland Government (2011). Weeds of Australia Biosecurity Queensland Edition. Department of Environment, Victoria Primary Industries (2015). Agriculture Victoria (VRO). It invades and establishes in highly disturbed natural ecosystems where it grows in dense stands, displacing indigenous vegetation and altering the lower strata. It is listed as invasive in China, Japan, parts of Africa, United States, Puerto Rico and Australia (CABI Invasive Species Compendium). There are many points in GBIF, including areas of Australia with climate similar to California. Paspalum dilatatum is a closely related grass which is also widely naturalized due to its use as a pasture grass. It is also invasive in some Pacific Islands, Hawaii, Australia, Europe and South Africa. PIER (0). Pacific Island Ecosystems at Risk (PIER) Risk Assessments. In Hawai‘i, grows in dense stands in mesic areas along forest roads, trails and open disturbed areas at low to mid-elevations, where it displaces native vegetation. No information is available on this question. 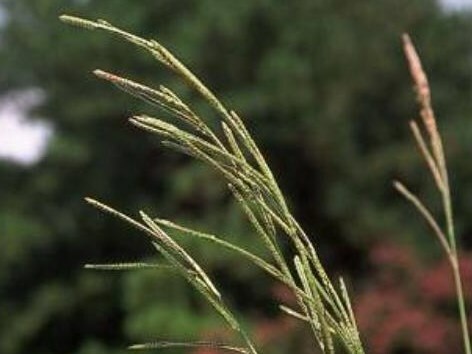 P. urvilli is used as a forage grass so is not toxic to livestock and promotes grazing. Plants are up to 220 cm tall and are perennial grasses so would not form impenetrable thickets. It spreads both by seed and by rhizome. Propagates by seed. Plants are able to produce seed either under open- or selfpollination (Caponio). Caponio, I.., & Quarín C.. L. (1990). Intra- and Interspecific Hybridization between Dallisgrass and Vaseygrass. Crop Science. 30(2), 362. More than 25,000 seeds produced per plant. Abundant seed set in the second or third year of sowing. Length of seed production is not mentioned in references, but flowering occurs from June to December (Jepson). This species reproduces mainly by seed, which are dispersed by wind, water, animals, vehicles, machinery, and in contaminated soil and agricultural produce. This species reproduces mainly by seed, which are dispersed by wind, water, animals, vehicles, machinery, and in contaminated soil and agricultural produce. The number of seeds per kg is 970,000, making this a likely pathway for unintentional introduction in hay bales or seed mixes. Proven ability to disperse greater than one kilometer (Agriculture Victoria).